Madame Alexander Dolls, Games, Artwork and More! It was pouring for most of Saturday but I was able to attend one indoor charity sale which lifted my spirits. There was a box of dolls that said $2 each or 3 dolls for $5. I recognized some as Madame Alexander. These dolls have a wide range of values. Two of the dolls that I picked up also had tears in their dresses. The best one I picked up was a cute nurse doll. She’s in good shape and hopefully will bring about $30. The next doll is from Gone With the Wind. She is Melanie and her dress is really beautiful but unfortunately, full of holes and faded. 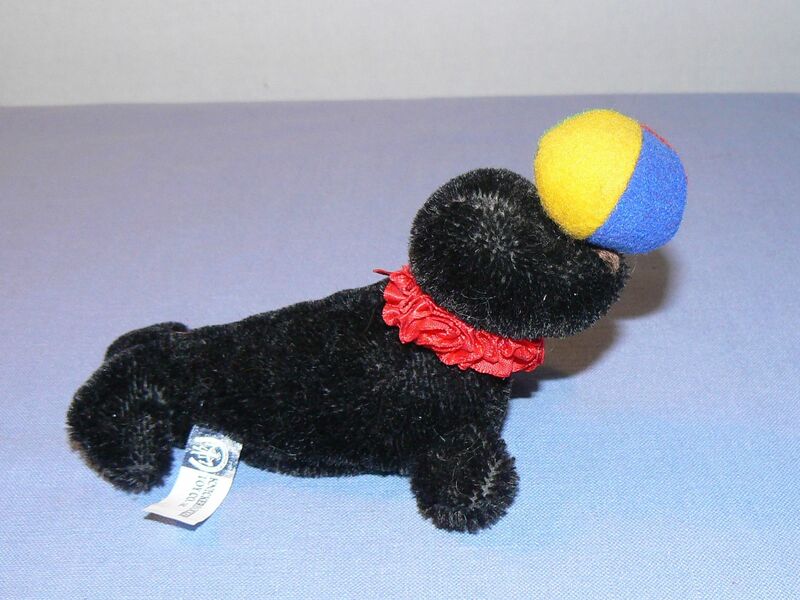 Another doll is from the International Collection and represents the United States. Again her dress is quite torn. A fourth doll I purchased is a Ginny doll by the company Vogue. Older Ginny dolls can bring a lot of money. This one, from 1985, is not very valuable. I can remember looking at the Christmas Sears toy catalog and seeing the beautiful Madame Alexander dolls, which were too expensive for us back then. It’s kind of fun to own them for a little while now. I also picked up a pair of denim rag dolls by Knickerbocker for Levis. Each has a denim jacket with the Levis logo on it. They seem to be fairly collectible. I hoping to get at least $30 for the pair. I picked up some artwork as well. First is this pair of cat art printed on ceramic tiles and framed. I love these because I love cats. The next item is my favorite item that I bought on Saturday. It is a watercolor painting of a highway interchange between the Long Island Expressway and the Clearview Expressway in Queens New York. It seems pretty old but I don’t know the age of it. The reason why I love this so much is because this is exactly where I grew up! I don’t know what the value would be on this – or even how to list it but I think it’s cool. It was $1. The second coolest thing I bought was this pair of cat shoes. This was a fund raiser for an animal shelter so there were a lot of animal themed items. These are not my style but I wish they were because I think they’re awesome!! I picked up two games. One is Pretty Pretty Princess which is a pretty popular game but I have never found it complete before. I am hoping to get $40 for it. The other game is called Eve Conquest and I believe it is connected with a game played online. It looks incredibly complicated. Finally, I picked up this Waffle Weave Loom kit. I believe it is from the 70’s. I picked it up because someone said that weaving items sell. I think I can get at least $20 for it and it has a fun retro look. Those are the highlights from one good sale I was able to go to. It will keep me busy listing this week! I usually do a best plush sales of the year blog but this year I didn’t really sell too much plush so I am including them in the toy and game category. These are my top 10 toy and game sales on Ebay for 2017 plus one honorable mention. This little duck is an origami rubber ducky. He is an honorable mention. I thought he was so unique and I couldn’t find another one anywhere. I picked him up at the thrift store for $1. He sold for $20. In the plush category, this watercolor Build A Bear Hello Kitty sold for $34.99. 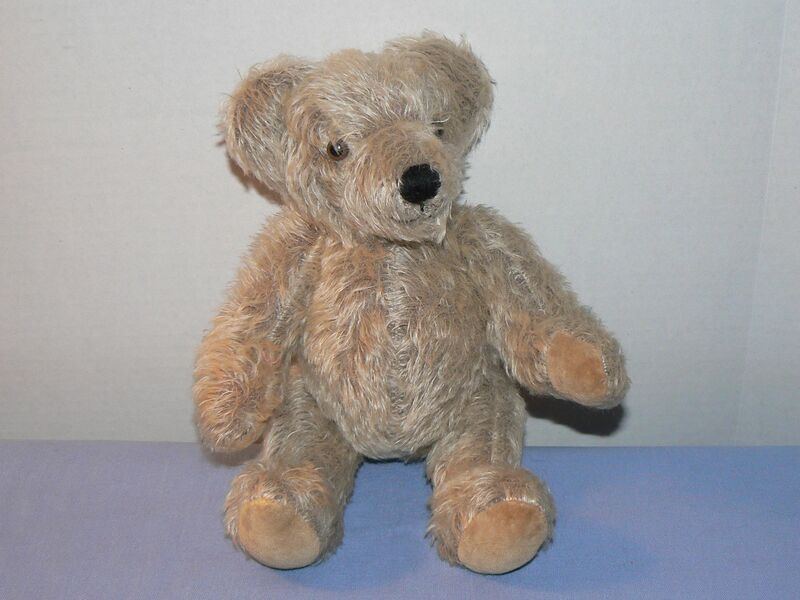 I don’t come across many Build A Bears that have value but I know that some of them do. This one was unusual looking and since I am a Hello Kitty fan I researched it and found that it would sell for a good price. It was important that it came with it’s detachable pink bow. I found this vintage board game at a school sale for $2 and fell in love with the little Hawaiian Punch mover pieces. This colorful game was complete and sold for $44.99. Pokemon can sell well and Tamagotchi’s can sell well so combine the two and you’ve got a good item. This is a Pokemon Pikachu Tamagatchi. It was new in the package however, I crushed the package under another item that I bought at the same sale and cut the value of this item in half. Good going me! It still sold for $49.99. 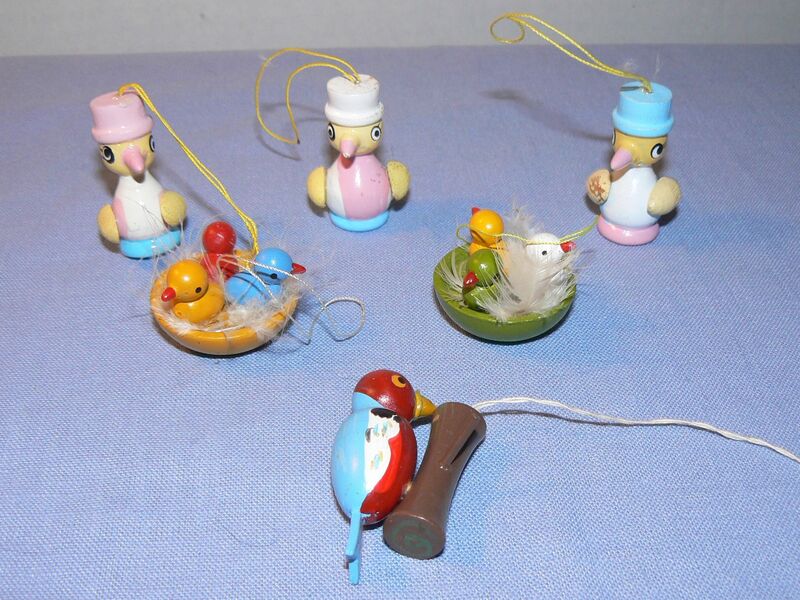 I love to find vintage Fisher Price. This is the hospital set that came with some of the Little People and accessories. It was picked up at a church sale for $5. I was very surprised to find it because it was about 2 hours after the sale had begun and I expected all the good items to be gone. It sold for $49.99. Shaker Maker is a toy from my childhood, in the 1960’s. I found this set at an estate sale, nearly complete and it even came with the powder solution. I picked it up for $3 and it sold for $59.99. I keep waiting for the Littlest Pet Shop resale bubble to burst but it hasn’t happened yet. This lot was $5 at a library sale, it included 39 pets and sold for $59.99. Also in the plush category, I found this Brer Fox Folkmanis puppet at a very expensive tag sale where they had researched everything and priced it all at Ebay prices. Except for the puppets. I bought this one for $5 and it sold for 64.99. Many years ago I picked up a vintage Park and Shop board game that was incomplete and in very bad condition but what I learned at the time was that, in good condition, these games sell well. This summer I found this one in beautiful condition and complete and it sold for $72.99. The new King Kong movie had just come out when I found this guy. He was very detailed and I felt like he was good quality. He was also quite large and heavy. I paid $4 for him and a church sale and sold him for $74.99. He looks so happy to have been sold for that much! I knew that these oversized Tinkertoys were valuable but I didn’t think I wanted to deal with the shipping headache. I saw these at a tag sale and when the guy said they were only $5 I was like “bring on the shipping headache!” I shipped them in their original box and they sold for $89.99. Those are my top ten toy and game sales for 2017! I attended an estate sale in a neighboring town. There were some photos in the craigslist ad and it said dolls so I was there. It was one of those where you take a number and they only let a certain number in at a time so that was frustrating. It was so packed with stuff. It may have been a hoarder. The stuff was kind of organized in piles but there was a lot of dirt and grime. Many of the items were from the early 1970’s which is when I was a child. I spent $69 which is high for me. Here are some of the items I picked up. In a box of dolls I found these two Barbies with no legs. They are talking Barbies from 1967. These don’t talk any more. I am hoping to get about $20 for each one – even without the legs. This next doll is a Happy Haley doll made in Hong Kong. She has that big eyed mod look. I really don’t know her value but I hope I can at least get $20 for her. She has quite a face. This small 6″ doll is a Holly Hobbie doll by American Greetings from the 1970’s. I hope to get about $14 for her. She has her complete outfit. The last doll I bought is this Baby Crissy doll. She is part of the Crissy Velvet Ideal hair growing doll family and she is giant. She is 24″ tall. In good condition she can bring good money but this one has some bad stains on her skin. I cleaned her up as best as I could. She has a very cute face. In the basement of this house were piles of games, puzzles and toys. It was all very grimy and I had to thoroughly wash everything. There were even a few items that were still in the original package but the packages were in such bad shape. Even though the item inside is probably in great condition, the torn plastic is a problem. I found a vintage Fisher Price Family Camper in the original box but the box just crumbled in my hand. The items, even though it looked like they had never been played with, were still kind of dirty. I cleaned everything. The set was complete. These next two items were sealed in the package but the plastic in each case is torn in several places. One is a vintage doll puzzle which I’m tempted to keep and the other is a Colorola which I remember from my childhood. Neither is worth a lot of money and probably wouldn’t sell at all except for the sealed factor. I love all the vintage pictures on these old toy boxes like the ones I found for this Bird series Shaker Maker set. I love charms and so I couldn’t leave this opened Charm Jewelry Kit behind. It’s dated 1971. Also sealed but again with torn plastic, is this vintage roll of Contact paper. It has very retro illustrations on it with girls wearing bonnets like Holly Hobbie and shaggy dogs. I also picked up a portable record player with a colorful cover. It seems to work but I don’t have any vintage records to really test it with. It was fun to dig through all that old stuff! We have a big storm today here in the northeast. A great day to list! 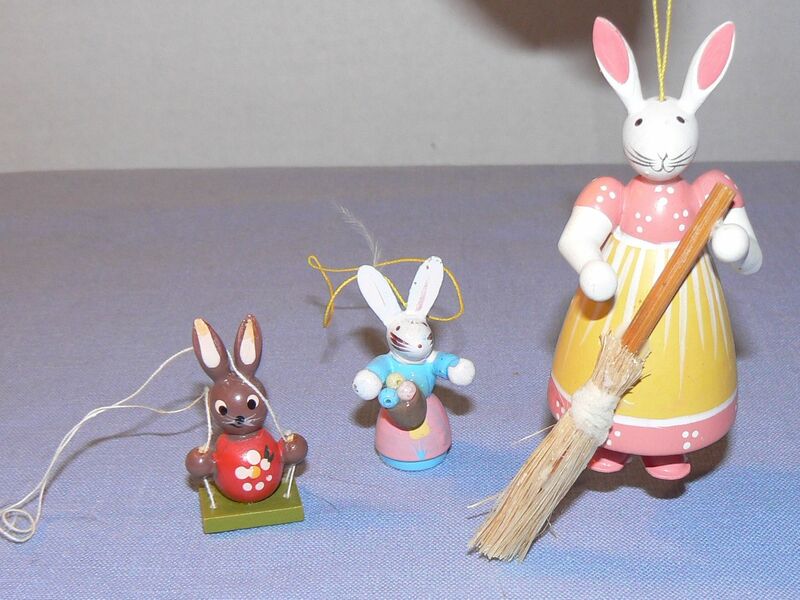 Vintage Easter, Christmas plus Mohair plush! I found a lot of vintage holiday items this week. I went to a sale on Friday, after work, that started at 9:00 so my expectations were pretty low. It was a fund raiser for a church chorale group and it turned out to be pretty small but what I found was a box of craft supplies and some figures that I recognized as Erzgebirge from Germany. These are small, detailed wooden figures. Most of the items seemed to be for Easter. I bought the box for $5 and spent about an hour sorting everything out. Many of the pieces were unfortunately broken, but below is what I ended up with. 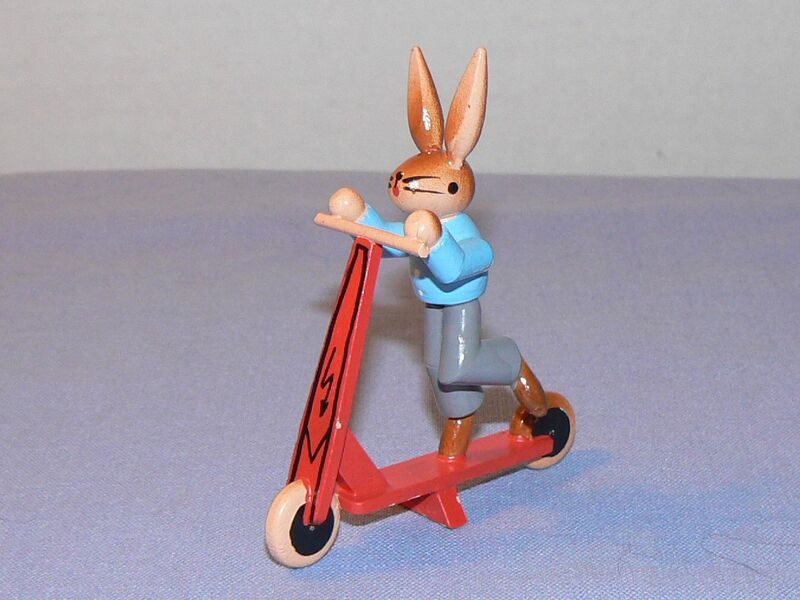 My favorite is probably the rabbit on the scooter. 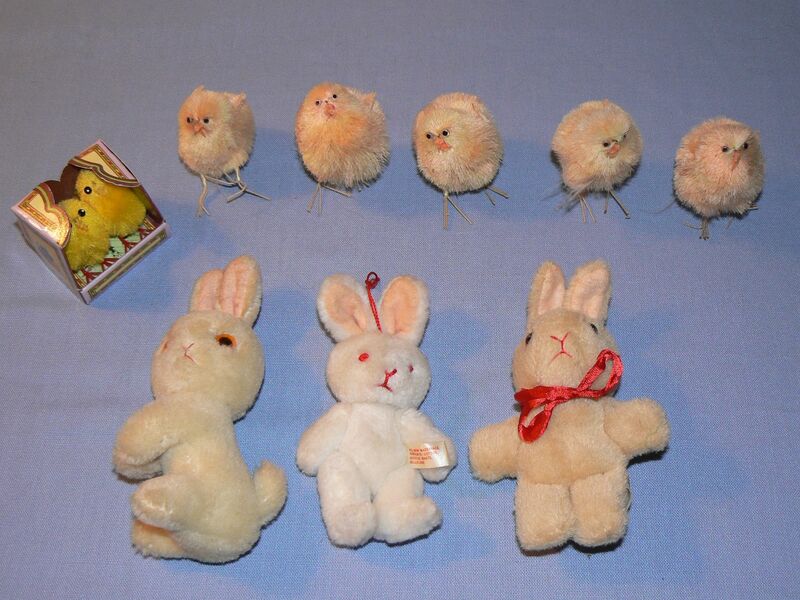 The plush rabbits and chicks I picked up at a different community sale. At another sale I went to for a school, I found some vintage Christmas items. 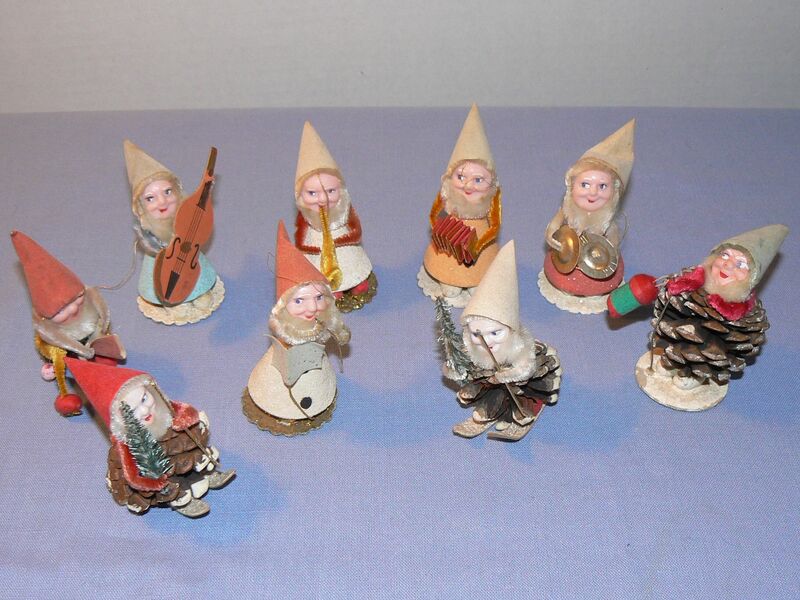 I think the coolest but kind of creepiest find was this set of Santas, most of which are playing instruments. 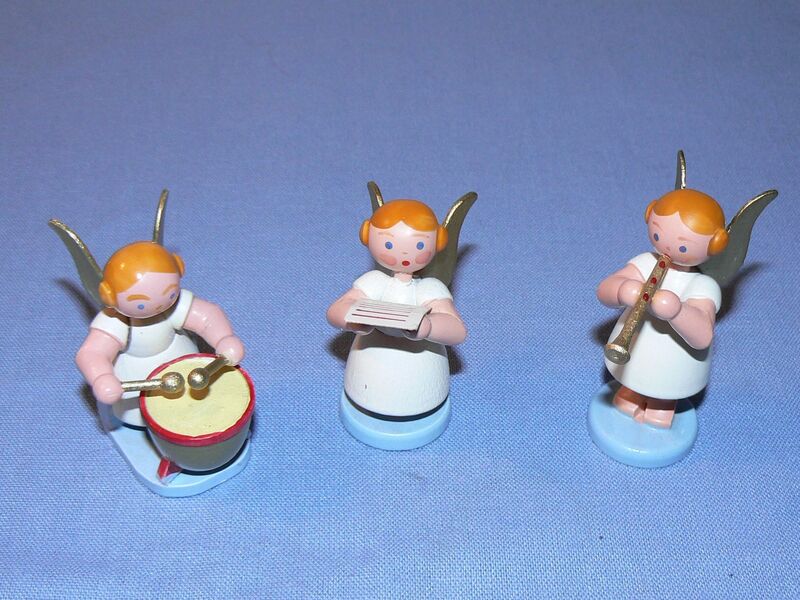 I also found some angels playing instruments. They look like more Erzgebirge to me but may just be in that style. 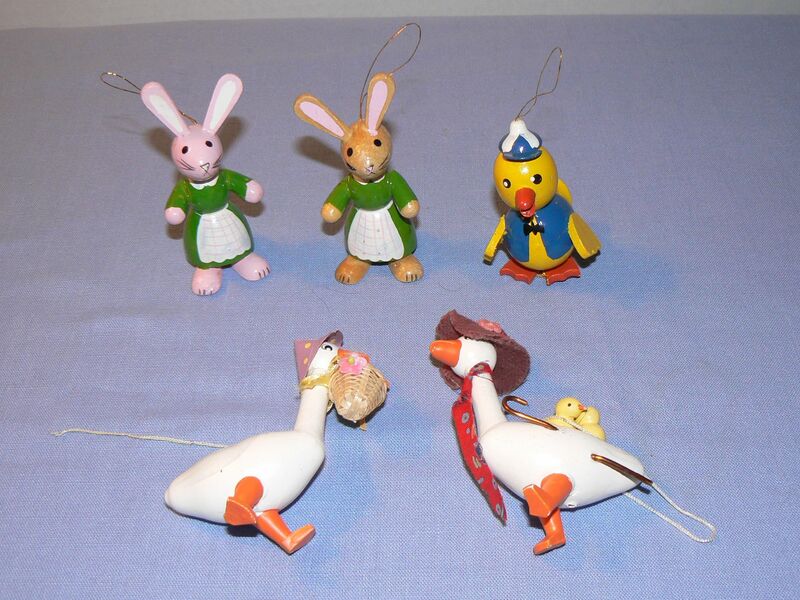 I don’t know if I will have any luck selling these items now because Easter and Christmas couldn’t be further away. Most of my finds for the weekend came from two school sales. One was at a Middle School and the other was for an elementary school. Needless to say, there were a lot of toys to search through. Here are some of the pick ups. 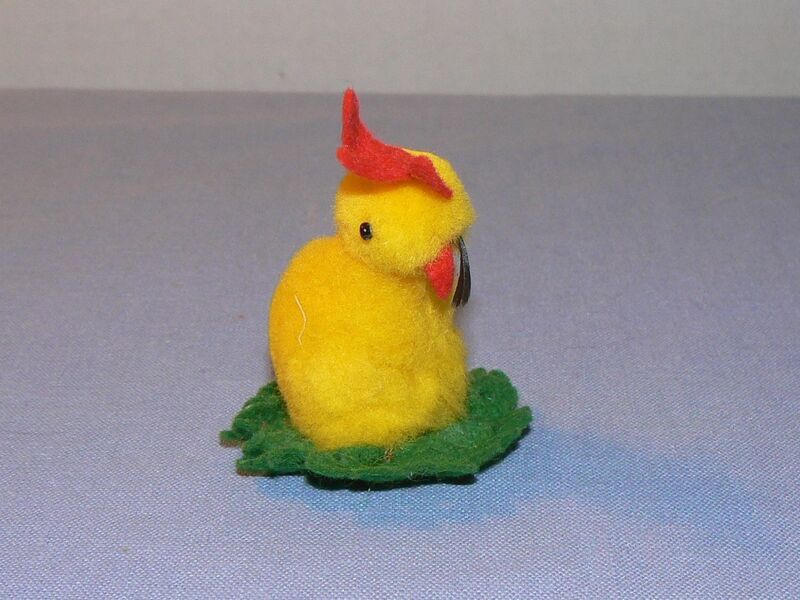 Mini Knickerbocker mohair plush animals. One is a bear and one is a seal. They measure only 4″ tall and I think they are very sweet. 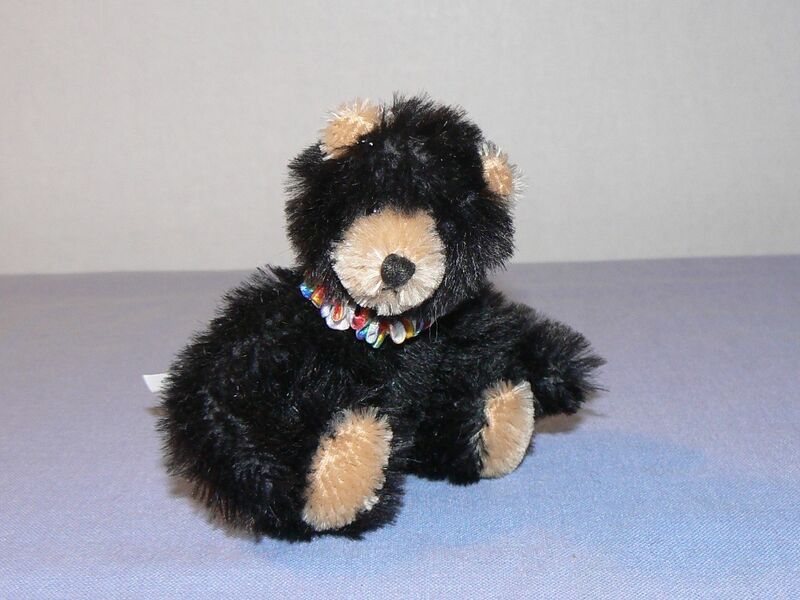 I also bought this teddy bear by a company called Kallisto. I think he looks very well made and vintage. 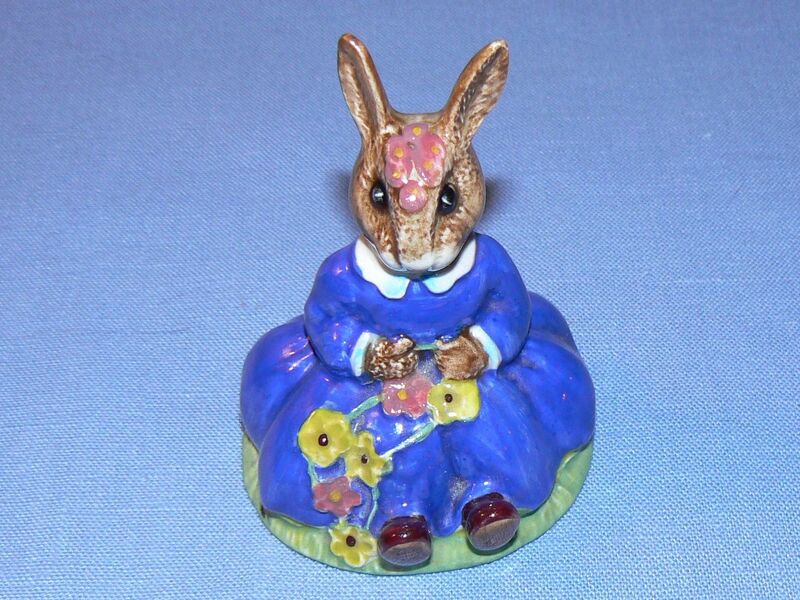 I found this Bunnykins figurine by Royal Doulton. She is only about 3″ tall and is making a chain of flowers. More rabbits!! 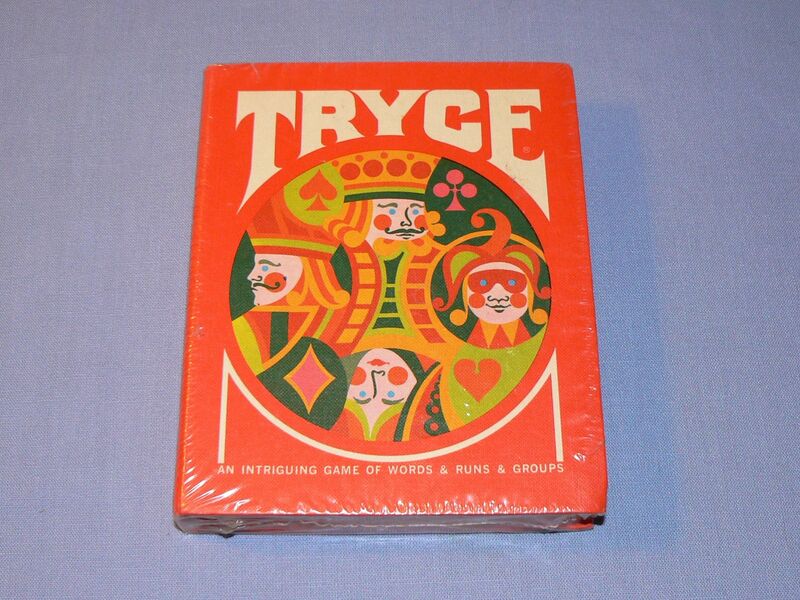 One more find was this vintage card game called Tryce. It is from 1970. I never heard of it before but since it was still in its plastic wrap I took a chance on it. I like the graphics of the cover. That’s it for me. I have a lot of listing to do! I hope you are enjoying the abundance of sales out there! !